The purpose of the Franklin Expedition was to map out the North-West Passage from Europe to Asia. This story can be linked to Victorian attempts to complete geographical knowledge of remote regions (i. e., in terms of the relief of the land and the climate), to fulfill the historical goals of Elizabethan navigators and explorers such as Sir Walter Raleigh and Sir Francis Drake (i. e., in terms of the historic context of such a journey on the development of the North), as well as to English Literature, in terms of its link to such stories involving polar settings and issues of survival as Mary Shelley's Romantic novel Frankenstein (1818) and Samuel Taylor Coleridge's literary ballad The Rime of the Ancient Mariner (which opened the 1798 edition of Lyrical Ballads). The Franklin Expedition had five years of food supplies, including 8,000 tins (in one-, two-, four-, six-, and eight lb. capacities) of meat, vegetables, and soup. In Frozen in Time (1987), basing their conclusions on forensic examinations of two of the expedition members' bodies, Owen Beattie and John Geiger contend that the tins were sealed improperly, with lead solder running down the inside of each tin; since lead if ingested is poisonous, the metal probably seeped into the crews’ food. In addition to the technical innovation of tinned goods, Franklin's vessels the "Erebus" and "Terror" had cabins which were heated by hot water piped through the floor. The ships' bows were reinforced with iron planks to help them break through ice. Moreover, each ship was equipped with a specially designed screw propeller driven by a wheel-less steam locomotive from the London and Greenwich Railway. Thus, better equipped than any previous polar expedition, Sir John Franklin set out on his fourth search of the North-West passage on 19 May 1845, with 134 sailors and officers. They were last seen by the crew of two whaling ships, the "Prince of Wales" and the "Enterprise," in Baffin Bay at the end of July. In 1850, near the mouth of Great Fish River, Inuit hunters discovered the bodies of 30 men and a number of graves. Since some of the bodies were mutilated, the natives believed that the white men had resorted to cannibalism. In 1819, Franklin had surveyed 340 kilometers of arctic shoreline east of the Coppermine River, but had lost ten men to starvation and cold on the return journey to Hudson's Bay over the tundra. In his second expedition (1825-1827), he had mapped another 640 kilometers of arctic coast, and was subsequently knighted and promoted to governor of Van Diemen's Land (now the state of Tasmania in Australia) for six years. He was, therefore, a highly important figure in his own right, so that the disappearance of his well-equipped expedition caused considerable speculation among the British populace and in government. 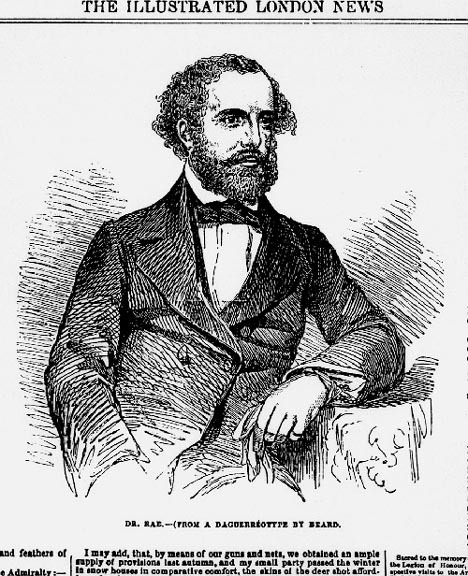 Consequently, in 1848 the British Admiralty sent three relief expeditions: the first, under Captain Henry, searched the Bering Strait; the second, under James Clark Ross, scoured the region around Lancaster Second; and the last (overland) under the Hudson Bay Company's Dr. John Rae and Sir John Richardson descended the MacKenzie River. 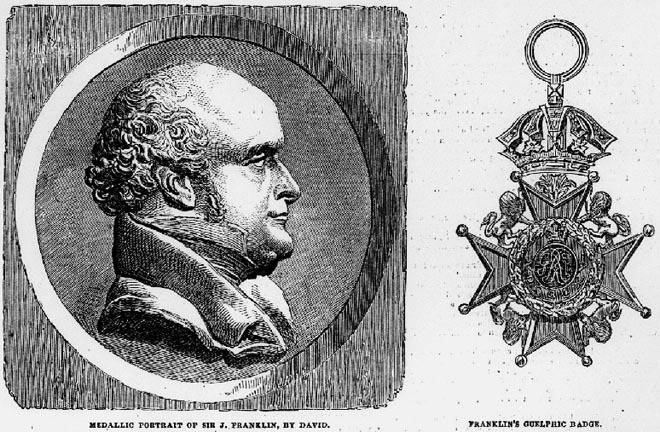 On 4 April 1850, the Toronto Globe advertised a £20,000 reward for the discovery of Franklin's party, an amount which was subsequently increased by an additional £20,000. Part of the account which Dr. Rae eventually delivered to the Admiralty in 1854 (a report which caused considerable controversy upon its publication, Rae's charges of cannibalism meeting with shocked disbelief by Household Words editor Charles Dickens ) is transcribed below. April 1854. We were now joined by another one of the Natives who had been absent seal hunting yesterday, but being anxious to see us, visited our snow house early this morning, and then followed up our track. This man was very communicative, and on putting to him the usual questions as to having seen "white men" before, or any ships or boats--he replied in the negative; but said, that a party of "Kabloonas," had died of starvation, a long distance to the west of where we then were, and beyond a large River; -- He stated that, he did not know the exact place; that he had never been there; and that he could not accompany us so far. The substance of the information then and subsequently obtained from various sources was as follows. In the spring, four winters past (i. e., in 1850), whilst some Esquimaux (Inuit) families were killing seals near the shore of a large island identified on Arrowsmith's charts as King William's Land, about forty white men were seen traveling in company southward over the ice and dragging a boat and sledges with them. Although none of the party could speak the Eskimo language so well as to be understood, by signs they lead the Natives to believe that the men’s ship, or ships, had been crushed by the ice, and that they were now heading south, where they expected to find deer to shoot. From the appearance of the men (all of whom, with the exception of a single officer, were hauling on the drag ropes of the sledge and were looking thin) the party seemed to be running short of provisions, and they purchased a small seal or piece of seal meat from the natives. The officer in charge was described as being a tall, stout, middle-aged man; when their day's journey terminated, the men pitched tents. At a later date the same season, but previous to the disruption of the ice, the bodies of some thirty persons and some Graves were discovered on the continent, and five dead bodies on an Island near it, about a long day's journey to the north west of a large stream, which can be no other than Great Fish River (named by the Esquimaux Ool-koo-i-hi-ca-lik), as its description and that of the low shore in the neighborhood of Point Ogle and Montreal Island agree exactly with that of Sir George Back. Some of the bodies had been buried (probably those of the first victims of famine); some were in a tent or tents; others under the boat, which had been turned over to form a shelter, and several lay scattered about in different directions. Of those found on the Island one was supposed to have been an Officer, as he had a telescope strapped over his shoulders and his double-barrel gun lay beneath him. From the mutilated state of many of the bodies and the contents of the kettles, it is evident that our wretched Countrymen had been driven to the last dread alternative — cannibalism — as a means of prolonging existence. A few of the unfortunate Men must have survived until the arrival of wildfowl, (say, until the end of May), as shots were heard, and fresh bones and feathers of geese were noticed near the sad event. There appears to have been an abundant stock of ammunition, as the powder was emptied in a heap on the ground out of the case or cases containing it; and a quantity of ball and shot was found below the high- water mark. having probably been left on the ice close to the beach. There must have been a number of watches, compasses, telescopes, guns (several double-barreled), etc., all of which appear to have been broken up, as I saw pieces of these different articles with the Esquimaux, and, together with some silver spoons & forks, purchased as many as I could get. Not until 1859 did the last search party, led by Leopold McClintock, find the cairn containing messages confirming Franklin's death, and skeletons of some of the last survivors, some of whom had apparently resorted to cannibalism. According to a note found in the cairn at Point Victory, "Sir John Franklin died on 11th June 1847" at a point when only 24 men had thus far died. Most of the 129 members of the Franklin expedition perished while trekking southward after abandoning two ships trapped in the ice off King William Island in 1848. The assumption had always been the explorers died from scurvy and starvation. Beattie, Owen and John Geiger. Frozen in Time . Saskatoon: Western Producer Prairie Books, 1987. Dickens, Charles. "The Lost Arctic Voyagers." Household Words, 2 December 1854. "Lead solder big factor in deaths of explorers." Victoria Times-Colonist . 1 February 1990. B9. Nayda, Lillian. Unequal Partners: Charles Dickens, Wilkie Collins, and Victorian Authorship. Ithaca and London : Cornell UP, 2002.